Image courtesy of Ink Stories. A scene from 1979. Image courtesy of Ink Stories. Navid Khonsari wasn’t disappointed when his Kickstarter campaign failed. 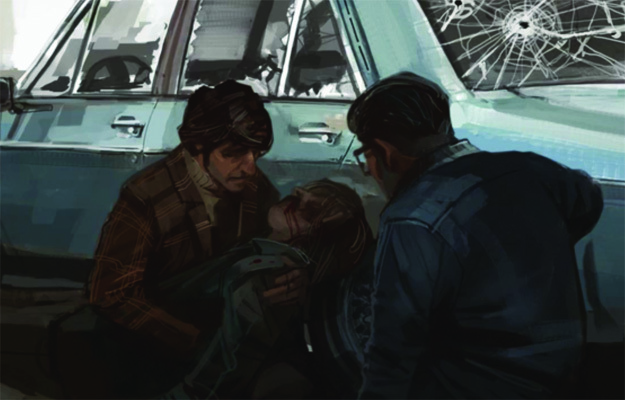 Having worked on games like Grand Theft Auto and Max Payne, his latest project is 1979 Revolution – a first-person game for PC and iOS taking place during the Black Friday protests of the Iranian Revolution in 1979. He says that the amount of media coverage they received from the Kickstarter campaign alone was “overwhelming to say the least”. The project is now scheduled to come out at the end of this year thanks to backing by larger investors. 1979 is very different conceptually than, say, GTA: Vice City. Khonsari had specific hopes for what the game would achieve. “Our objective is for you to experience what took place, [and] come to your own conclusions as a result. There is really no academic agenda.” He wants his audience to gain a personal understanding of what realistically happened during that time. Video games, for the most part, have not traversed into the educational market. There have been some games in the past that have tried to use the platform for an educational agenda, but they have largely been unsuccessful; the slightest suggestion of motives that aren’t conducive to the gaming community can completely ruin the experience for a player. However, as the gaming experience becomes more personal, the idea of using knowledge and real emotion to represent a historical event no longer seems novel. This capability isn’t lost on Khonsari.“I guess the main aspect of the game that differentiates it from, say, an academic agenda is that … we want you to experience what took place. I think that if you were going to experience it, it would strip away a lot of those limitations that have been put on us to try to learn human events through historical analytics.” The “experience” that 1979 is providing is drawn from a range of places. Khonsari himself witnessed the protests when he was ten years old, as did most of the development team. The concept art comes from the photojournalism of Michel Setboun, who documented both sides of the revolution at the time. It’s come at price, however, with the project being labelled “Western propaganda” by Iranian media, Khonsari being called a spy, and an overwhelming amount of developers’ names and photos omitted from the credits for anonymity purposes. There have been various indie games made in past few years, ones which haven’t been lost in the education/gamer market divide, attempting to slot the player into a situation that they would probably not have otherwise been exposed to. Papers, Please is a game made by former Naughty Dog developer Lucas Pope, which gives you a chance to explore the nuances that dictate the lives of immigration officers. In his game, however, his goal “was to build an interesting story” and not “set out to make a political statement”. The game still undoubtedly provides an experience that no other medium is able to provide: you as the player are given the choice to dictate the behaviour and the movements of the game. You feel responsible and you quickly learn that if you are given a choice, than you are capable of making a change. In that sense, Pope doesn’t deny that games are perfect in this way, admitting they “have a unique ability to build empathy … letting the player experience something in a more personal way than other media”.There’s no question that the themes that 1979 deals with are widely misunderstood parts of history outside of the Middle East. But that is exactly what makes it such an appealing game. Khonsari knows that in order for a piece of art to create an emotional response, there needs to be a least some level of familiarity or connection between the gameplay and the gamer. “I think that in the end, the one big hurdle we have in front of us is that we have to make sure that the content is truly universal.” In the end, the success of a game is measured by how “into it” the gamer becomes. If you’re made to identify with the character, you’re going to feel a stronger connection to what’s happening. 1979 will have to find a universal theme to pull the player in. Khonsari and his team, by using the motivations underpinning the revolution, are on to a pretty good one.